What's the value of your marriage? I have a friend who says you can always determine what's important to people by looking at their check register. How do they spend their money? If you look at your check register what would it say about the importance of your marriage? What percentage of your income is allocated to your relationship? Another way to assess value is by time invested. 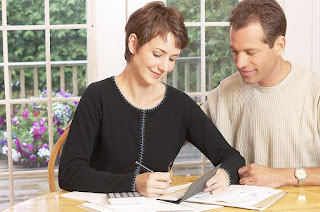 Most people probably spend more time planning for their financial future than they do for their marital future. Why is that? You can also assess what we value by what we protect. We don't leave money lying around, because we believe it has value and we don't want someone to take our hard earned cash for their own benefit. Those who value money work not only at protecting it, but at increasing the amount of it. They make time to create budgets and meet with investment counselors to assure a good return on their investment. They analyze companies before making investments to minimize risk. Do you go to the same lengths in protecting your marriage as you do your money? Are you spending the same energy and effort on proactive marriage counseling? Are the contributions to your marriage equal to or greater than the contributions made to your retirement account? All too often those who stray are under invested in their relationships. Their primary contribution to the relationship is their wage, and if money provides the sum total of your investment, what's the loss if you walk away? But if you've worked together, built a home together, raised kids together, and shared life together, the size of that investment may help you see there is something worth salvaging. Excerpted from "What are the 5 simple and proven steps that will protect your marriage?" by Rick Reynolds. Reprinted with permission. Rick Reynolds LCSW, founder of AffairRecovery.com, a national leader in offering personalized online infidelity support as well as the free Affair Analyzer, offers tips to protect your marriage from infidelity. This is one of the best posts I've read on the subject. Tammy and I see money only as a means to serve our marriage. The money we make is used to meet our primary needs, of course, but the rest is spent on fun times together. Fun can mean eating out, reading and discussing the same book, any kind of intellectual development, coffee out, little get-aways anything that is fun! Hi Rick. I am the Tammy of CJ's post above, and I agree that this is a fine post indeed. So glad to see you here! We have spent 15 years investing in our marriage. We are happy to say we're growing closer and closer. Our investments include forgoing presents to plan trips for each other's birthdays. We have hiked mountains and canyons and discovered fascinating little places. We enjoy tackling life together through fun, learning, and growth every day! I am so happy to see you promoting an investment in relationships. It certainly is worth it! This is such a wonderful reminder for all of us in marriages or long term committed relationships that it is just as important to invest in happiness as it is to invest time in our financial situations. A few suggestions I have are to: surprise your partner with a massage, leave thank you notes, take over all of the chores for a day or two, take walks together, etc. I think these little actions go a long way into showing your commitment and devotion to the marriage, and not so much how much money you have or how you are spending it. Remember that in divorces money and property is often split but the little gestures listed above will always remain personal and intimate and might aid in the process of reconciliation. We do focus too much on finances, but I think it’s because it is the one constant in our lives. If perhaps we are taught from early ages how to focus on healthy relationships, marriage would be a lot easier.